Thu Hong Nguyen was sentenced to 74 years in prison Friday for starting a fire at her nail salon in 2015, killing two firefighters. On Friday, a Jackson County judge sentenced the woman convicted of starting a deadly fire at her own nail salon to 74 years in prison. Firefighters, law enforcement officials and family of the two firefighters killed in the fire — John Mesh and Larry Leggio — packed the courtroom and an overflow room. Thu Hong Nguyen was mostly stoic throughout the hearing, something the prosecutors used against her, arguing she never showed any remorse for her actions. Mesh's daughter Alyssa Mesh called Nguyen a "selfish, careless, messed up woman." Nguyen's son, Davis Nguyen gave a statement in defense of his mother's character, sharing that his mom raised three sons alone and worked hard to support them. "It is not easy, to hear this persona made of her," he said, adding that this was only a page out of the more complex story of their lives. After her son left the stand, Thu Hong Nguyen's head fell back in her chair, and she started gasping for air. The judge called for a 15-minute recess and the crowd cleared the courtroom. A firefighter volunteered to go in and check on her and then called for EMTs, who came with a stretcher. After 15 minutes, the hearing continued and Nguyen returned to her seat for the final arguments. Nguyen's lawyer argued it wasn't a fair fight, questioning whether the firefighters should have been positioned in an alley several minutes after an evacuation order, pointing t0 a report from the Kansas City Fire Department after the incident. The prosecuting attorney called on the "real, ragged and ongoing pain" the community in the Historic Northeast has gone through since the incident. 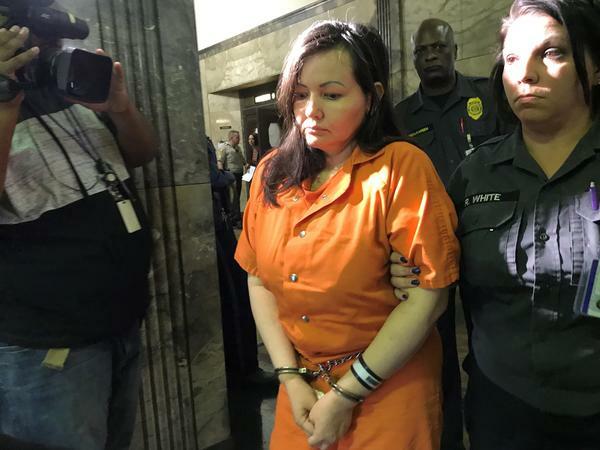 In July, Nguyen was found guilty of murder, arson and assault for starting the fire that incinerated her own nail salon, L&N Nails on Independence Avenue, and engulfed two floors of the apartments above. Mesh and Leggio died just after saving two civilians from the apartments when a brick wall collapsed on them. Prosecutors traced Nguyen to several other nail salon fires in Texas and Missouri over the course of eight years and presented evidence that she had collected nearly a quarter of a million dollars in insurance payouts from them. The turnout Friday was indicative of the great impact the fire had on the"tight-knit" community in the Historic Northeast. The businesses on the block suffered after the fire from broken windows and smoke damage, and the lot where the salon stood has remained vacant for the past few years. In June, a Blue Springs-based developer proposed building a strip mall in the vacant lot, but neighborhood leaders spoke out against the idea, pushing for a residential development. Leaving the courtroom Friday, Jackson County Prosecutor Jean Peters Baker said justice had been served, thanking the ATF for their extensive investigation into Nguyen's history of fires and subsequent insurance claims. "It's truly been one of the very best investigations I have seen," Baker said. Nguyen will likely spend the rest of her life behind bars, although her attorney told the court she planned to appeal the ruling Monday.